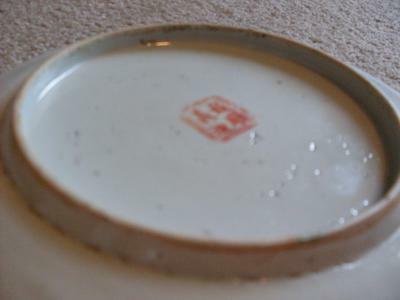 HELLO PETER, BOUGHT THIS BOWL AT A SALE WAS WANTING TO KNOW IF IT'S CHINESE, AGE. OR HAS SOMEONE FAKE IT. LOOKS LIKE MARK IS ORANGE LOOKING NOT RED?? 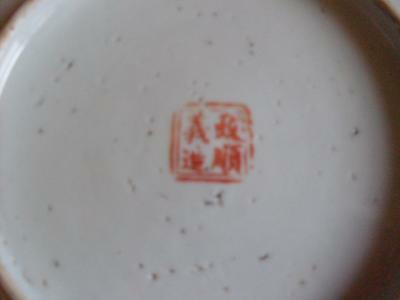 AND THERE SOME KIND OF MARK INSIDE OF BOWL TOOK PICTURE OF IT. THANK YOU FOR YOUR TIME AND INFORMATION. I WILL SEND 2 BLOGS TO GET YOU ALL PICTURES. 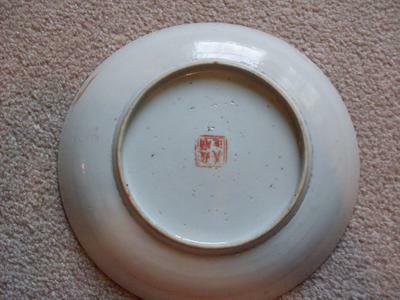 I think this is a dish or plate, not a bowl. 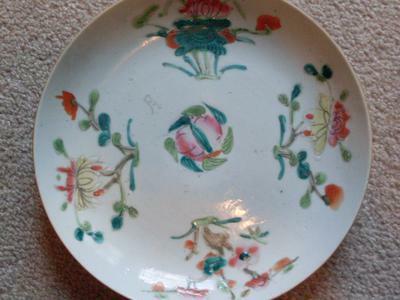 The bent up round rim is typical for Chinese style plates. 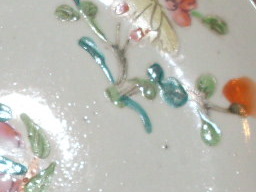 Those with a straight outward rim are either export porcelain or were made under the influence of such. 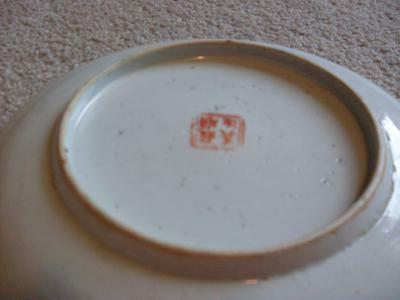 This is a very standard late Qing dynasty dish, probably Guangxu reign. Every collector will encounter this type earlier or later. There is a private mark: ? Shun Yi zao (made by ? Shun Yi). I cannot read the first character clearly, maybe someone else can help out (Shelley, can you read it?). This is a private mark, but it is not relevant for authenticating this. The dish shows perfect age signs. 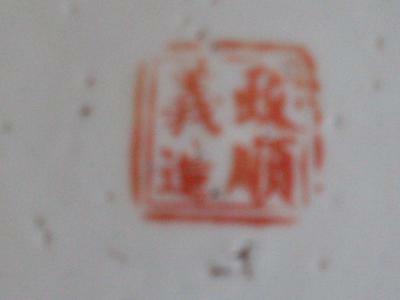 Often referred to as Chinese Famille Rose. -"The Four Seasons" design. You can Google search "German Gulch - University of Montana"
they show a spoon fragment, and its a great blog!